In just 11 days, this trip takes you on a journey to experience the best of what Bolivia has to offer. Visit some of Bolivia’s main cities: La Paz, where you can witness the living history of the pre-Hispanic times with all their traditions and magic rites; Santa Cruz, known for its unusual species of animals and exotic birds, butterflies and orchids; Sucre, the constitutional capital of Bolivia; and Potosi, a famous colonial city where the silver mines are the main attraction. Also experience miles and miles of dazzling white nothingness at the Uyuni Salt Flats, the largest on earth; the archaeological site of Tiwanaku, ruins of one of the oldest civilizations in the Americas; and Lake Titicaca, the “Sacred Lake of the Incas”, where you will observe authentic cultures living as they did thousands of years ago. Welcome to Santa Cruz, Bolivia! Located on the eastern tropical plains, Santa Cruz is known for its unusual species of animals and exotic birds, butterflies and orchids. It is a city filled with life. Mennonites and Japanese settlements, as well as some ancestral ethnic groups give this city a special flavour. Upon arrival in Santa Cruz, you will be transferred from the airport to your hotel. In the afternoon, enjoy a city tour in Santa Cruz. You will visit the Zoo, with a large variety of tropical species, the Ethnic-folkloric Museum, the main square, the Cathedral Museum, the Interpretation Centre of Santa Cruz; the handicrafts expo “Arte-campo” and other principal monuments of Santa Cruz. 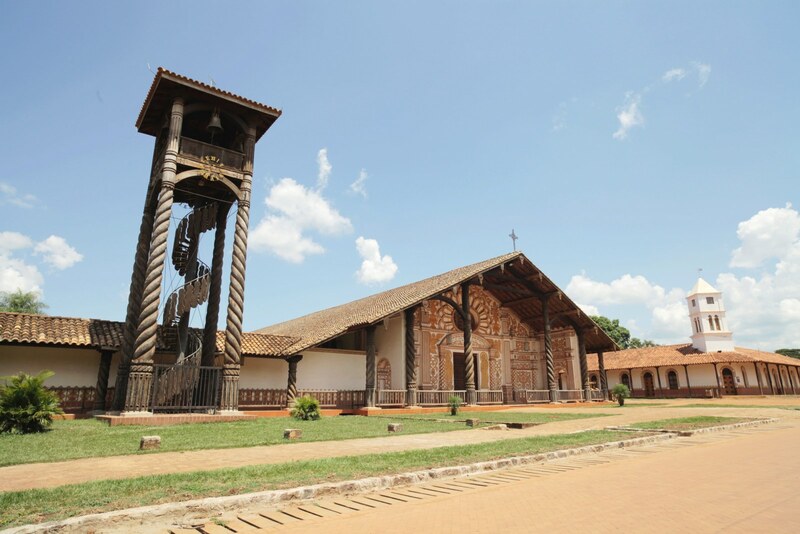 Today you will embark on a full day tour of the Samaipata Ruins. The road to this ancient Fort leads through the mountainous Andean area called “Volcanes”. Located just 120km (1.5 hours) from Santa Cruz, the Ruins of Samaipata is an archeological site built for magic rites by a pre-Incan culture. You can see strange carvings on a giant rock representing a snake and many other enigmatic figures. You will also have the chance to visit the archeological museum and take a bath beneath the waterfalls: Las Cuevas and el Chorro. In the afternoon we will return to Santa Cruz. This morning, you will transfer to the airport for your flight to Sucre. Sucre, the constitutional capital of Bolivia, is a living expression of both colonial and modern times. Its museums and streets tell all kinds of stories, not only of its people but also of Bolivia’s history. Narrow streets, all white houses, cozy cafes, Sucre is a city that welcomes visitors from all over the world, and takes you back to the 17th century. Upon arrival in Sucre, you will be transferred to your hotel. In the afternoon, enjoy a city tour in Sucre, visiting The Recoleta and San Francisco Church, the House of Liberty where Simon Bolivar signed the Independence of Bolivia; the second oldest University of the continent, San Francisco Xavier, and the local colourful market. Start an early overland journey to transfer to Potosi, the famous Colonial City and source of silver during colonial times. Potosi was declared by UNESCO “The Historical and Cultural Legacy of Mankind”. According to legend, the mountain that you see towering over the city has produced enough silver to build a solid silver bridge from Potosi to Madrid. Today you will visit the Santa Teresa Convent, as well as a silver or tin mine – the main local attraction. Learn about the basic conditions of the mine workers, and learn more about the mining industry, which was a primary source of income for the city in the past. In the morning visit The Casa de la Moneda, Bolivia’s Royal Mint. With its wooden machinery, this mint used to make the silver coins for Spain during colonial times. The Royal Mint is one of South America’s finest museums. You’ll find that learning about the history of the first global currency is fascinating! In the afternoon, transfer overland to the Uyuni Salt Flats. This morning you will be picked up from your hotel for your full day excursion to the Salt Lake and Isla Pescado. Uyuni is the largest salt flat on earth, at almost 11,000 sq km, located on the Bolivian Andean Altiplano, comprising miles and miles of dazzling white nothingness. The Bolivian Andes offer stunning scenery which can hardly be matched. Active volcanoes, hot springs and a palette of color-splashed lakes populated by hardy flamingos punctuate these landscapes of blindingly bright salt plains and stunning deserts. The serenity makes the heart beat faster and the surreal pentagons of crystalline salt, the pure sky, the color lagoons, the cacti and the flamingos, certainly makes you feel like there is no other place like this in the whole world. Enjoy lunch at Isla Pescado, also called “Incawasi”, an oasis with formations of algae and fossils. It is covered by thousands of giant columnar cacti, which can be more than a hundred years old, growing to a height of over 12 meters. The landscape against the background of the salt plains extending to the horizon makes it an ideal place for photography enthusiasts. Visit the Moon Valley, a unique area featuring lunar landscapes and bizarre geological formations. This morning you will be transferred to the airport for your flight to La Paz. La Paz and its surroundings can transport you to a mysterious past where any corner, any street, is a hidden treasure where adventure begins; a living history which treasures the pre-Hispanic times with all their traditions and magic rites. The city’s great canyon unfolds before you in one of the most dramatic skylines anywhere in the world, dominated by the majestic Illimani Mountain with the three snow-crowned peaks. This afternoon, enjoy a city tour to visit the indigenous, colonial and modern areas, Indian Market, and Witch Doctor’s Market. At the market, learn about the different herbs and spices used for the traditional rituals, as well as the magic potions used to make the wishes come true. Situated 10 kilometers from downtown La Paz, we will visit the Moon Valley, a unique area featuring lunar landscapes and bizarre geological formations. Moon Valley isn’t actually a valley at all, but a maze of canyons and giant spires. The formations, composed mainly of clay and sandstone, were created by the persistent erosion of mountains by the area’s strong winds and rains. What remains is a serene setting, full of wonder and intrigue. This morning we will visit the archaeological site of Tiwanaku (1.580 BC-1.000 AD). These magnificent ruins of Bolivia belong to one of the oldest civilizations in the Americas. The Sun Gate, the Temple of Kalasasaya and the Pyramid of Akapana are the samples of a glorious past. Tiwanaku culture was an agrarian-based economy with an estimated population of 115,000 inhabitants. This evening, experience “The Mystic World of the Kallawayas”, natural healers of Bolivia. The Kallawayas believe that you first have to heal the soul in order to heal your body. Enjoy a lively experience, exhibiting all herbs, animals, amulets, spells and traditions which are part of this mysterious natural medicine healers of the Andes. Our Kallawaya, “Tata Benjo”, will bless our guests and forecast their future while casting his sacred coca leafs. Today we will embark on a full day excursion in Lake Titicaca. Emerging from blue sapphire waters, Lake Titicaca, the “Sacred Lake of the Incas”, has always been one of the most important life sources of the Andes, impelling the development of many ancestral cultures. A most fantastic experience is to meet authentic cultures living as they did thousands of years ago, close to Mother Nature, without challenging or hurting her; to walk in the solitude of the islands; to enjoy the hospitality of our natives and to learn from their traditional life. The Bolivian side of Lake Titicaca is a promise to the future and a joy for everybody who explores its sacred waters and its hidden treasures. We will take a Hydrofoil cruise to Moon Island. On this mystical island are the ruins of Iñak Uyu, Sun Virgins Temple. Here, the most beautiful maidens of the Incas were gathered and schooled to become the wives of the Inca nobles, after gaining valuable knowledge in agriculture and weavings. Continue to Sun Island, the cradle of the Inca Empire, founded by Manco Kapac and Mama Ojllo, sent to earth by Sun God Viracocha. Feel the magic of the island, by tasting the water of the Sacred Fountain, which is believed to grant eternal youth and happiness. We will lunch at the Uma Kollu archaeological Restaurant and visit the small handicraft market. Finally, we will cruise to Copacabana, located at the shores of Lake Titicaca. Once in Copacabana, visit the shrine and the Dark Indian Virgin. At the end of the day we will drive back to Huatajata. This evening, enjoy a nocturnal visit to the Native Observatory Alajpacha. Learn about the Aymaras Worldview, an indigenous nation in the Andes and Altiplano regions of South America, and watch the southern constellations. This morning, we drive back to La Paz. Enjoy a day at leisure in this exciting city. This morning, say farewell to Bolivia. You will be transferred to La Paz airport for your international flight home. Camino Real Hotel is strategically located in the fastest growing business area of ​​the city. It has 175 luxurious and spacious rooms and suites, its spectacular swimming pool, a professional and complete Spa, and the dedication of a personalized service, provide the guest with a unique experience of pleasure, luxury and comfort. Parador Santa María is a unique hotel with past, history and art, where the value of the tradition of yesterday and today manages to awaken our senses. It occupies a manor house of the XVIII century recovered and rehabilitated, keeping intact its initial structure having respected all its constructive details. Hotel Coloso Potosí has 50 warm and comfortable rooms to enjoy a pleasant stay, providing you with a sauna, pool and fitness center, and a restaurant and bar. The Cristal Samana Hotel has the privilege to be located at she shore of the Uyuni salt flat. Starting from the welcome, we offer services and commodities to our visitors in a very special way, so that they will remember us and their unforgettable stay. The hotel’s design is based on the Feng Shui architecture. You can feel the flow of positive energy generated through the stimulation of the five senses. The warmth of the personnel and the place will merge with the sensation of feeling at home, with all the comfort you can find in the city. Tambo Aymara is conveniently located in Uyuni Town on the south-eastern corner of the Salt Flats and is best known for being the gateway to this spectacular saline desert. The lodge has 15 rooms, all simply decorated, cosy and with central heating and private bathrooms. Within walking distance from the town’s markets and restaurants as well as being a great place from which to explore the salt flats, the Tambo Aymara Lodge is a comfortable option. Europa Hotel has the best location in the city. Only one kilometer from the main square and touristic area, as well as a few steps from the commercial area and government offices. As a member of Preferred Hotels & Resorts, we guarantee the highest quality standards in our facilities and services. Enjoy all the comforts of a five-star hotel. Enjoy our fitness center, heated pool, dry and steam sauna, whirlpool, ice water well and massage rooms. We commit our professional and personalized service to make you stay a pleasurable one – a PREMIUM EXPERIENCE. Located at the most panoramic shore of Lake Titicaca, Inca Utama Hotel & Spa offers a different hotelier concept, designed to introduce visitors to the ancestral Andes cultures, through different cultural attractions. This unique hotel has 53 double rooms and 4 suites in the new colonial tower – all of them provided with electric blankets and individual heating. The hotel offers you: The panoramic restaurants “La Choza Nautica” (on the water) and “Sumaj Untavi” with Folklore shows for groups and gourmet food, cozy bar with fireplace, gift shop, and other facilities.